Breezy, funny and frequently pointless Ant-Man and The Wasp is either a superhero comedy with action bits or an action film with comedy bits and no one seems sure which one it is. Authorial indecision fills every minute of the follow-up to 2015’s Ant-Man keeping the various entertaining pieces from ever gelling together into a complete whole. 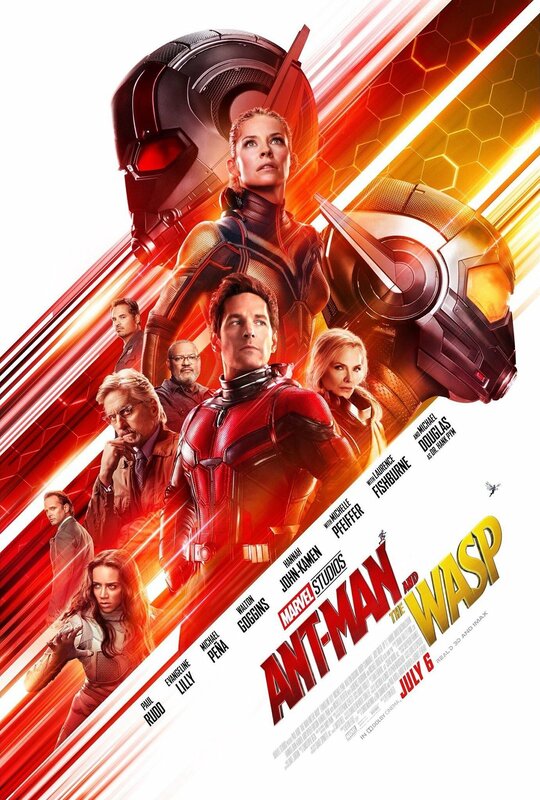 There’s a lot to like about the newest Marvel film – most of it circling around Ant-Man (Rudd) and Wasp (Lilly) themselves – but it takes a lot of work to dig it out from under two villains, four concurrent plots and a ton of ant puns. Roughly two years after the events of Captain America: Civil War, Ant-Man and The Wasp picks up on what Scott Lang has been doing since then … namely playing drums and building elaborate mazes for his daughter to play in. Meanwhile former Ant-Man Hank Pym (Douglas) and daughter Hope have been on the run from the law while searching for the long lost Janet Van Dyne (Pfeiffer). Just as it looks like their quest is at an end a mysterious saboteur (John-Kamen) shows up looking for Janet herself. The only chance of beating her to the punch is if Scott and Hope can patch up their differences and turn themselves into a real team. Also there’s a black market weapons dealer who wants Hank’s technology, Scott’s need to stay ahead of the government agents who want to arrest him for becoming Ant-Man again, Luis’ (Peña) upcoming presentation for a big client he and Scott need to land to keep their new business running plus a few more things. 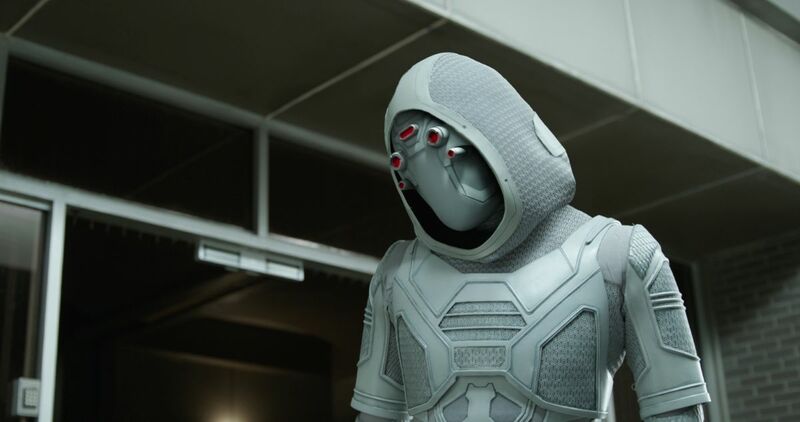 There is a lot going on in Ant-Man and The Wasp and most of it does not mesh together very well no matter how hard director Peyton Reed (and his five writers) try. One big question the notably troubled production of the first Ant-Man raised was how much of the finished film was the vision of original director Edgar Wright and how much came from replacement Reed. With Reed returning for the sequel we start to get a lot more of an idea and it’s a mixed bag at best. On the one hand many of the individual bits – be they action or comedy – are excellent in and of themselves. He takes full advantage of Rudd and Peña’s skill with comedy, especially Rudd’s skill with self-deprecation. The filmmakers have also spent a lot of time thinking of more size changing gags and integrating them into the action sequences. When Ant-Man and The Wasp actually do get a chance to fight together it’s truly thrilling. Unfortunately it also highlights how out of balance much of the film is. It’s not so much that no one has any idea what exactly to do for Scott’s next act (the thunder of the Giant Man reveal having been stolen, albeit with great effect, by Civil War) as they have too many. Rather than winnow them down to a single focused narrative Reed has decided to use them all. He seems to love nothing so much as to let Scott embarrass himself (actually, he just seems to like this kind of humor in general, and uses it liberally). It really is funny in and of itself (especially when combined with size malfunctions on Scott’s suit) but it’s the kind of joke that requires time to work, everyone has to stop while Scott squirms. In a pure comedy that’s fine, in an action film it stops momentum cold and it’s unclear if the reward is worth the cost. It also takes time away from the necessary storytelling needed to connect the bones of the film together leaving new characters underdeveloped and exposition rushed. New villainess Ghost, who has the potential to be new and interesting with a personal story that has nothing to do with destroying the world or the like, is left to get all of her backstory out in one terrible monologue which carries no emotional weight or connection for the audience, and she’s one of the lucky ones. It also has a lot of the issues sequels always have, with elements carried over for no reason other than the appeared in the previous film, such as Luis’ various shaggy dog stories and the ex-cons they work with. It also reboots Scott and Hope’s relationship back to the status quo of the first film rather than think of a new way to develop it. Every so often all of these elements come together into something truly fun, but then they fly apart again leaving you wondering how much better this all would be if a few bits were lopped off it. If any word sums up Ant-Man and The Wasp it’s the one you never want to hear about a sequel: extraneous. The post Ant-Man and The Wasp Review appeared first on ComingSoon.net.